Peter was born in Nairobi, Kenya on 16th February 1950 to Adelaine Florence Hain (nee Stocks) and Walter Vannet Hain. Peter’s parents were South African born, his mother of British 1820 settler descent and his father of parents who had emigrated from Glasgow during the 1920’s. Peter is the eldest of 4 children: Tom, Jo-anne and Sally. Peter’s family returned shortly afterwards to Pretoria, South Africa, at a time when the repressive Apartheid regime was tightening its grip on South African society. Outraged by the daily discrimination and abuses they saw being perpetrated under Apartheid, Peter’s parents, Adelaine and Walter Hain, found themselves becoming more and more involved in the opposition to Apartheid. When Peter was 10, he was awoken in the early hours of the morning with Special Branch Officers searching through his bedroom drawers for ‘incriminating evidence’. Peter became accustomed to multicultural meetings taking place in his home and visiting black townships which his white friends never did. Special Branch would regularly park outside the Hain household and would follow them wherever they would go including school. First his mother and then his father received banning orders. This meant that they were unable to attend public places such as the children’s school. They could not be part of a gathering – though the numbers of a gathering were never specified and they could not communicate with other banned people. They were issued with special addendums to their banning orders allowing them permission to communicate with each other. Both Adelaine and Walter were imprisoned for a period of two weeks for sticking up anti-government posters. Eventually it was made impossible for Walter to get work as an architect. As the family had no private means they were forced to leave South Africa so that Walter could find work in London. Once the SA government realised that they were making plans to leave, the couple were issued with exit permits, ensuring that it would be illegal for them to return to their own country. Peter was 16 years of age when the family arrived at Southampton Docks in April 1966 and the family settled in Putney, London, where he went to a nearby school. His parents’ struggle made a lasting impression on Peter who himself took up the fight against injustice. Following his arrival in Britain Peter became involved in anti-Apartheid protestes, disrupting an international Davies Cup Match against Britain with a sit-down. Then at the age of 19 he became chairman of the Stop The Seventy Tour. As Chairman of the STST campaign in 1969-70, Peter scored the first victory for anti-apartheid protests by first heavily disrupting the all white Springbok rugby tour and then finally stopping the all white South African cricket tour of Britain. His mother, father, brother and sisters were all involved in helping him run the STST from his home. Following his campaign Peter was named as “South Africa’s Public Enemy No 1.” As Desmond Tutu said recently, “Peter was such a stalwart in the Stop the Seventy Tour Campaign…someone we were glad to have on our side”. In 1972 Peter received a letter bomb from the South African security police (fortunately it had a technical fault and was defused.) In the years that followed, Peter was a leading campaigner against racism in Britain, and in 1977 was a founder member of the Anti-Nazi League which was successful in confronting and then effectively destroying the National Front. Peter Hain was educated at Queen Mary College, University of London, where in 1973 he obtained a First Class Degree in Economics and Political Science. He also holds a Master of Philosophy from the University of Sussex. He is the author or editor of fifteen books and has written widely in pamphlets and articles on Labour policy and socialist ideology. 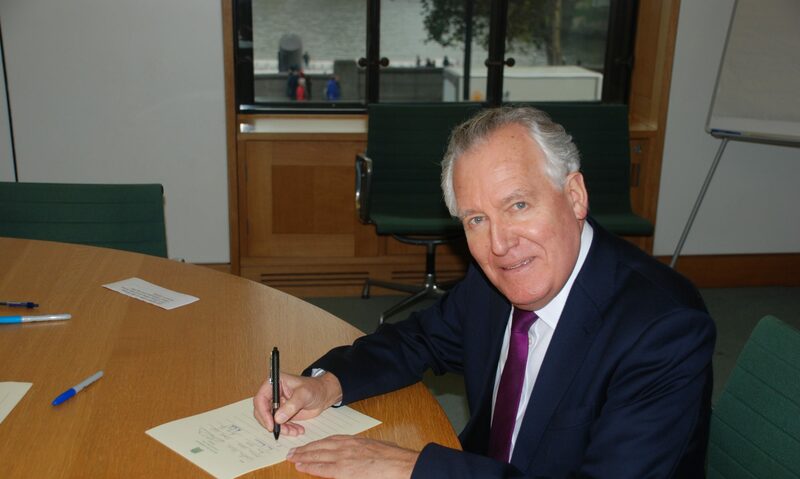 Peter Hain joined the Labour Party in 1977. In the years that followed, Peter focused his campaigning energy and political activity locally in Putney Constituency Labour Party. He stood as Labour candidate for Putney in the 1983 and 1987 elections. He became Vice Chair of the reforming Labour Co-ordinating Committee, which played a prominent role in the party’s reconstruction following the disaster of the 1983 general election. Throughout this period, Peter also dedicated himself to the trade union movement, both professionally, as head of research for the Union of Communication Workers (UCW), and as a member of the GMB. Peter entered the House of Commons in a by-election in 1991 as Labour MP for the South Wales Valley of Neath, a former mining community. He has continued to be the MP for Neath since. On 14th June 2003 he married Dr.Elizabeth Haywood at a ceremony in Neath and they live in Aberdulais in the Neath Valley. Elizabeth is a successful Welsh businesswoman and has been Chair of the CBI in Wales and a previous Welsh Woman of the Year. Peter has two adult sons, Sam and Jake, from his first marriage. Sam and his wife Paula have four children Harry, Seren, Holly and Tesni. Peter is a proud grandparent and spends as much time as he can with the next generation of Hains. His sister Sally and her daughter Connie live nearby in Neath as do his parents Walter and Adelaine. His youngest son Jake and wife Kirsten live in London with their son Cassian.